At the invitation of Malaysian Foreign Minister Saifuddin Abdullah and Singaporean Foreign Minister Vivian Balakrishnan, State Councilor and Foreign Minister Wang Yi will visit Malaysia and Singapore and attend in Singapore the Foreign Ministers' Meetings on ASEAN Plus One (China), ASEAN Plus Three (China, Japan and Korea), East Asia Summit (EAS) and ASEAN Regional Forum (ARF) from July 31 to August 5. Q: The 10th BRICS Summit was held in South Africa yesterday, after which the Johannesburg Declaration was published. What is your comment on this summit? Could you tell us more about the outcomes of the summit? A: The BRICS Johannesburg Summit is the first summit to be held in the second "golden decade" of the BRICS cooperation. In face of the enormous volatility and uncertainties in the international landscape, the developing countries and emerging markets strongly hope to step up communication and coordination to cope with risks and seek mutual benefits and win-win results. As representatives of the developing countries and emerging markets, the BRICS countries sent out unequivocal message in support of multilateralism and against unilateralism and protectionism, showcasing our cohesive power and solidarity to rise above difficulties. In his address, President Xi Jinping stressed that we need to firmly safeguard the rule-based multilateral trading regime, promote trade and investment liberalization and facilitation, and reject protectionism outright. South African President Cyril Ramaphosa, Brazilian President Michel Temer, Russian President Vladimir Putin and Indian Prime Minister Narendra Modi all believed that against the complex and volatile international backdrop, BRICS countries should step up cooperation, uphold multilateralism and international rules, promote free trade and safeguard the WTO rules. The BRICS Summit Johannesburg Declaration issued by the summit underscores the importance of an open world economy, reaffirms the centrality of the rules-based, transparent, non-discriminatory, open and inclusive multilateral trading system as embodied by the World Trade Organization (WTO), and calls on all members to abide by WTO rules and honor their commitments in the multilateral trading system. As the largest developing country and emerging market, China will continue to actively participate in the BRICS cooperation and work with other members to make economic globalization more open, inclusive, equitable, balanced and win-win and create greater opportunities for the common development of developing countries and emerging markets. Q: I have a question about the election in Cambodia. Does China support Hun Sen's reelection? How do you respond to critics who say that Beijing has offered over-support for his reelection in the run-up to the poll on Sunday? A: The ballots of the election for the Cambodian National Assembly will be cast on July 29. This is Cambodia's internal affairs and a major event in the political life of the Cambodian people. China supports the Cambodian people in choosing a development path that suits its national conditions and supports and looks forward to a successful election. We also hope that the international community will play a constructive role in helping the Cambodians to hold a successful election and achieve the continuous and steady development of the nation. Q: Could you brief us on the relevant situation of State Councilor and Foreign Minister Wang Yi's visits to Malaysia and Singapore and the current China-Malaysia and China-Singapore relations? A: State Councilor and Foreign Minister Wang Yi will visit Malaysia from July 31 to August 1. He will then visit Singapore and attend the Foreign Ministers' Meetings on the East Asia Cooperation from August 1 to 5. During his visit to Malaysia, State Councilor Wang Yi will meet with Prime Minister Mahathir and hold talks with Foreign Minister Saifuddin. During the visit to Singapore, State Councilor Wang Yi will meet with President Halimah and Prime Minister Lee Hsien Loong and hold talks with Foreign Minister Wei Vivian. Malaysia and Singapore are important members of ASEAN and China's friendly neighbors and important cooperation partners. The bilateral relations between China and Malaysia and China and Singapore have been developing very well, bringing tangible benefits to the two countries and their peoples. After the establishment of the new government in Malaysia, our two countries have been carrying forward our friendly and cooperative exchanges. Prime Minister Mahathir attaches importance to relations with China and supports the Belt and Road Initiative. Last week, he sent his special envoy to China with whom Premier Li Keqiang and State Councilor Wang Yi exchanged views on the development of bilateral relations. The upcoming visit of State Councilor Wang Yi will convey China's sincere wishes to deepen China-Malaysia friendship, discuss with Malaysia on how to promote bilateral relations, and exchange views on bilateral cooperation and regional and international issues of mutual interest. China and Singapore have established an all-round cooperative partnership progressing with the times, and bilateral cooperation under the framework of the Belt and Road Initiative has been fruitful. Singapore is currently the rotating president of ASEAN and is also the coordinating country of China-ASEAN relations. In April this year, Prime Minister Lee Hsien Loong visited China and attended the 2018 Boao Forum. The Chinese leaders reached important consensus with him on developing bilateral relations and promoting regional cooperation. The upcoming visit of State Councilor Wang Yi to Singapore aims to implement the important consensus reached between the leaders of the two countries, strengthen strategic communication, deepen pragmatic cooperation, and exchange in-depth views on China-Singapore relations, cooperation on the Belt and Road Initiative, China-ASEAN relations, and other regional and international issues of common concern. Q: Imran Ahmad Khan, Chairman of the Pakistan Tehreek-e-Insaf, announced that he has won the election for the National Assembly on July 26. In a televised speech, he spoke highly of China-Pakistan relations and stressed that the new administration will further enhance its friendship and cooperation with China, advance the building of the China-Pakistan Economic Corridor and draw upon China's anti-corruption and poverty alleviation experience. What is your comment? What is China's expectation for China-Pakistan relations going forward? A: We are closely following the ongoing election in Pakistan. We sincerely hope that Pakistan will smoothly complete its political transition, maintain stability and achieve greater development. The Chinese side noted Mr. Imran Khan's remarks on the China-Pakistan relationship. He said on many occasions previously that Pakistan's relationship with China serves as the cornerstone for its foreign policies, and no matter which party takes office, it won't change Pakistan's friendly policies towards China. He said that Pakistan is willing to learn from China's experience of development, and values and firmly supports the CPEC which he believes is of great significance to the country. China highly commends this and believes that Mr. Imran Khan and other people from all sectors in Pakistan are all staunch champions for China-Pakistan friendship. His remarks also fully showcase that China-Pakistan friendship is an all-weather one. However the internal situation in the two countries may evolve, the China-Pakistan all-weather strategic cooperative partnership will remain unchanged, as this is in the common interests of the two countries and two peoples. Q: The ROK said today that it had scrambled jets to intercept Chinese aircraft in its Air Defense Identification Zone. This has happened previously this year and the ROK has complained to China about it. Do you have any comment on this latest incident? A: I'm not aware of this situation, and I would like to refer you to the military. Q: The intensive rescue operation after the dam break in Southern Laos is still underway. You said the other day that China is in close communication with the Laos on disaster relief efforts. Do you have any updates? A: As a close and friendly neighbor to the Laos, China is paying close attention to the disaster relief efforts regarding the hydropower dam collapse in the Laos. General Secretary and President Xi Jinping sent a message of condolence to General Secretary and President Bounnhang Vorachith. Premier Li Keqiang sent a telegraph of condolence to Prime Minister Thongloun Sisoulith. State Councilor and Foreign Minister Wang Yi also extended condolences to Foreign Minister Saleumxay Kommasith. We hope and believe that under the leadership of the Lao party and government, its people will overcome the difficulties and return to normal life and work at an early date. Over the past days, we have been in close communication with the Laos on the disaster relief work. After consultation and coordination, a medical contingent of the Chinese People's Liberation Army (PLA) on the "Peace Train-2018" Humanitarian Medical Rescue Joint Training Mission has rushed to the disaster-hit region to assist in the rescue efforts. In the meantime, at the request of the Laos, the Chinese side is preparing relief supplies as quickly as possible which will be delivered to the Lao side very soon. Q: As State Councilor and Foreign Minister Wang Yi is about to attend the Foreign Ministers' Meetings on the East Asian Cooperation, how does China evaluate the current China-ASEAN relationship? What are your expectations for these meetings? A: China always places ASEAN on the front page of its foreign cooperation, and regards ASEAN as the priority of its neighborhood diplomacy and a key area of the Belt and Road Initiative. This year marks the 15th anniversary of the establishment of China-ASEAN strategic partnership and it is also the China-ASEAN Innovation Year, a great time to review the path we have traveled and look forward to the future. In the past 15 years, the cooperation between the two sides has grown from small achievements to fruitful outcomes, mutual political trust has been continuously enhanced, pragmatic cooperation has been deepened, and people-to-people and cultural exchanges have become increasingly close. China-ASEAN relations are the most successful and dynamic model for the Asia-Pacific regional cooperation. China-ASEAN relations have entered a mature period of upgrading, ushering in new opportunities for development. China is willing to continue to deepen cooperation with ASEAN, strengthen the docking of development plans, further consolidate pragmatic cooperation, enhance political and security cooperation, and jointly build a closer community with a shared future. 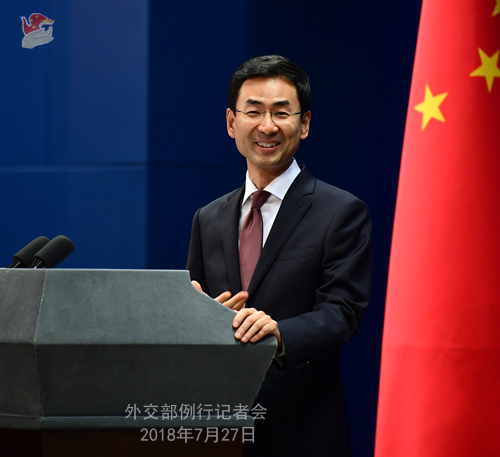 At the same time, we will properly handle the South China Sea issue, strengthen pragmatic maritime cooperation, and jointly safeguard peace and stability in the South China Sea. State Councilor and Foreign Minister Wang Yi will attend four Foreign Ministers' Meetings and exchange views with other foreign ministers on China-ASEAN relations, the East Asian cooperation and regional and international issues of common interest. The East Asian regional cooperation is an important platform for regional countries to carry out dialogue, strengthen cooperation and promote development. It is hoped that with the joint efforts of all parties, the Foreign Ministers' Meetings will focus on cooperation, expand consensus, further promote regional cooperation and development, and contribute to regional peace, stability, development and prosperity. Q: According to German media, Germany is preparing for the first time to prevent the takeover of a German company by Chinese investors for strategic reasons. The Chinese company is called Yantai Taihai and the German company is Leifeld Metal, which produces parts for cars and planes well as well nuclear equipment. What's your comment? A: We noted relevant reports and are paying attention to this. In recent years, China and Germany have been working to deepen bilateral relations and maintain a sound momentum for two-way investments, which plays a positive role in promoting the economic development and employment of the two countries. In face of rising protectionism and unilateralism, China and Germany, as two major economies in the world, have the responsibility to uphold free trade and multilateralism, boost the bilateral high-standard and mutually beneficial cooperation through two-way opening up, and inject positive energy to sustaining an open world economy. We hope the German side can treat Chinese investment objectively and provide open and fair market access and stable institutional framework for Chinese companies to invest in Germany. Q: On July 26, President Xi Jinping met with Indian Prime Minister Narendra Modi in Johannesburg. I was wondering if you could just elaborate what transpired in their bilateral meeting? Did they talk about the border issue following the agreement in Wuhan? Did the US trade disputes also figure in their talks? A: The Chinese side has released the readout of the meeting between President Xi Jinping and Indian Prime Minister Narendra Modi. If necessary, I could repeat some points in that readout. At the meeting, President Xi stressed that China and India should ensure the implementation of their important consensus reached in Wuhan. The two sides need to strengthen strategic communication, enhance mutual trust, expand practical cooperation and people-to-people exchanges, step up communication and properly manage differences. President Xi pointed out that as the main emerging markets and the guardians of and contributors to the existing international order, while bolstering bilateral cooperation, China and India need to jointly explore new models for regional cooperation, champion multilateralism, stand for economic globalization and make the international order more equitable and reasonable. Prime Minister Modi said that he met with President Xi Jinping three times in just three months, which fully testifies to the high standard of China-India relations. The Wuhan meeting, a milestone in the history of India-China relations, contributed to significantly enhancing mutual trust and will generate new driving forces and opportunities for the long-term development of bilateral relations. India is willing to maintain close dialogue and communication with China, deepen across-the-board cooperation and properly handle differences. It is also ready to work with China to strengthen cooperation within multilateral frameworks, jointly rise up to challenges developing countries and emerging markets are facing because of protectionism and international market fluctuations, and promote closer partnership for development. Q: First, maybe you could provide some more information on the meeting between President Putin and President Xi Jinping besides the press release which was put on the website of the foreign ministry? Second, the US Treasury Department recently imposed sanctions on five entities and eight individuals for allegedly helping to acquire electronics for the Syrian government's chemical weapons development institution, including one Chinese company and one Chinese citizen. What is China's comment on this? Is China going to investigate the involved Chinese company and citizen in this case? A: Regarding your first question, I have no more information to offer. On your second question, China's position on the non-proliferation issue is consistent and clear. 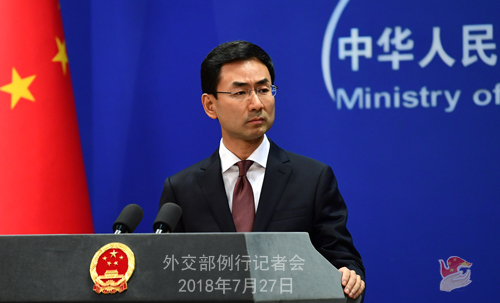 China firmly opposes all forms of proliferation activities, strictly fulfills relevant international obligations and commitments, and always conducts non-proliferation work in accordance with its own policies, laws and regulations. In the meantime, China opposes the imposition of unilateral sanctions and so-called "long-arm jurisdiction" by certain country in accordance with its domestic laws. Such unilateral sanctions neither help to enhance the mutual trust between relevant parties nor contribute to the joint efforts and cooperation of countries to resolve certain international issues. Q: Regarding the visit of Chinese Vice Foreign Minister Kong Xuanyou to the DPRK, can you introduce the purpose and results of this visit? A: The relevant news has been posted on the website of the Ministry of Foreign Affairs. I have nothing further to add. Follow-up: Did the two sides discuss issues related to the Korean Armistice Agreement? A: You will find the answer in our readout if you read it carefully. Q: The readout on President Xi Jinping's meeting with Prime Minister Modi did not mention anything related to the Sino-Indian border. However, the Indian side said yesterday that the leaders of the two sides agreed to instruct the military to enhance bilateral communication and ensure the stability of the Sino-Indian border. Can China confirm? A: I have just introduced the relevant situation of the meeting. During the meeting, President Xi Jinping pointed out that the two sides should implement the important consensus reached in Wuhan. As for what the consensus includes, I believe you know it well. In addition, both President Xi Jinping and Prime Minister Modi pointed out during the meeting that the two sides should strengthen communication and dialogue and properly manage differences. I would like to stress once again that China is always willing to work with India to implement the consensus of the leaders of the two countries and jointly safeguard peace and tranquility in the border areas. This is in the common interest of both sides. Q: It is reported that on the 26th, Navarro Kudlow, the Director of the US White House National Economic Committee, said that on economic and trade issues, he hopes that the United States and the European Union will unite to deal with China. What is China's comment? A: China, the United States and the EU are all major powers economically speaking and trade-wise. With such large trade flows between China, the United States and between China and the EU, it is inevitable to have some differences and frictions. What's important is how we look at them and choose to address them. 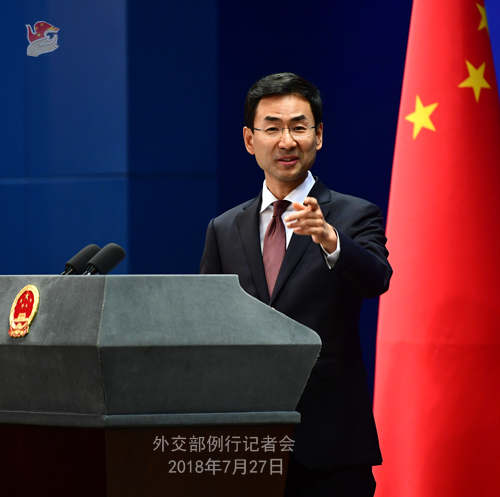 China always believes that trade differences and frictions should be resolved through dialogue and consultation on the basis of mutual respect, equality and mutual benefit. Unilateralism or protectionism offers no way out. You may have noticed that the China-EU leaders meeting was held in Beijing not long ago. The two sides issued a joint statement which clearly stated that the two sides should jointly resist unilateralism and protectionism. We believe that all parties concerned, especially the major economies in the world, should work together to promote the building of an open world economy.